Are you as profitable as you would want to be? Are there missed opportunities to grow your practice from your current patient base? Do you know the effectiveness of patient care provided by the doctor, the hygiene department, and the practice as a whole? Get the guidance you need to move toward problem solving with in-depth analysis in a simple, efficient and economical manner. 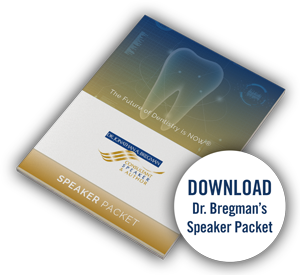 An on-site visit allows Dr. Bregman to analyze first-hand all aspects of your practice and the functioning of the dentist and entire team. Coupled with a dentist/team questionnaire and analysis of the ‘numbers’ of the practice, a plan will be created to help the practice move toward its desired goals. As a Clinical Treatment Analyzer™ Certified Analyst, Dr. Bregman performs in-depth analysis in a simple, efficient and economical manner. You will immediately be able to put into action what you have learned and begin to grow your practice from the inside. Provide your current fee schedule. Provide a computer-generated report of all procedures by ADA code performed in either a 6 or 12 month period. Your data will be processed using specially-designed software created by Dr. Charles Blair, producing 81 practice monitors/analysis points. Finally, a written report immediately follows.